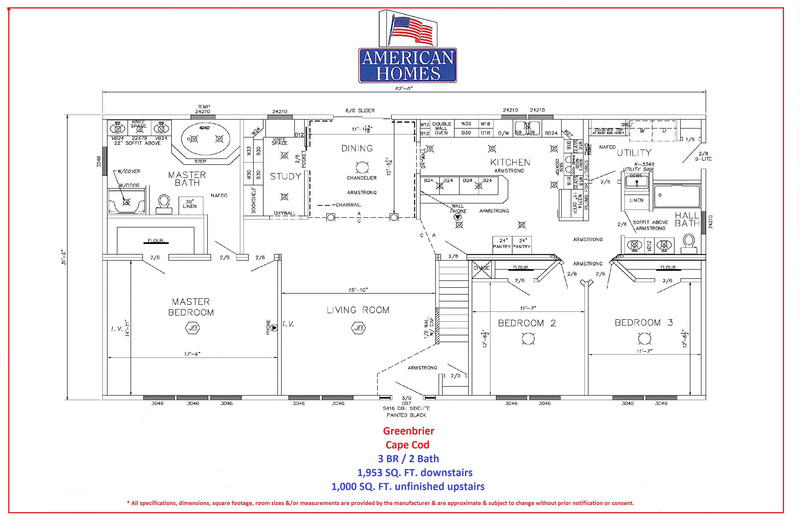 3 Bedroom / 2 Bath / 2,953 sq. ft. Distinguished and adaptable best describe the Greenbriar, a 3 bedroom 2 bath Cape Cod style home. Need more bedrooms? Or a place for the kids to play or watch TV? A guest or in-law suite? You can have it with The Greenbriar’s upstairs bonus room. Kitchen accents include a 4 person casual dining bar that doubles as a food preparation area, a double wall oven, and a wooden range hood. Decorous columns flank the dining area accented by a sliding door and white wainscoting. Recessed lighting throughout the 1st floor accents key areas such as the kitchen island. A well designated home office space complete with cabinetry is the perfect place to run a business or manage household affairs. The stately master suite features an impressive tub for soaking away stress as well as a large walk- in closet and his & hers sink with a vanity in the middle. The Greenbriar is prestigious, yet flexible, to meet your needs.